Volunteers joined together on an October Saturday to create an inspiring learning environment for children attending McNichols Educational Plaza. 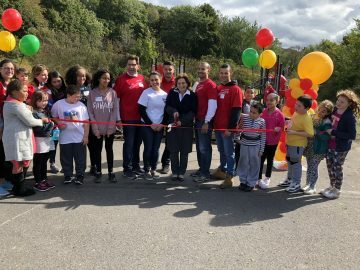 More than 70 Wells Fargo employees took part in the bank’s Signature Day of Caring, along with volunteers from the Scranton School District. McNichols is a preK-5 grade school that serves close to 500 students and their families and is committed to academic and behavioral excellence. The event provides significant support to McNichols including equipment, supplies and more than 350 volunteer hours to complete projects inside and outside the school. At the Signature Day of Caring, Wells Fargo presented The Scranton Area Community Foundation with a check in the amount of $65,000 in support of the school — a total that represents the cost of the materials provided for the day. Volunteers lend their time and energy to support and complete projects including the installation of playground equipment, the creation of a kindergarten storytelling area, stencil painting in several locations including the playground macadam, and the planting of hearty perennial flowers. In addition, the school will receive 60 Chromebooks for a portable computer lab a well as a new sound system.